In computing, a DMZ (demilitarized zone) is a method for separating untrusted traffic from a trusted network. One of the most common implementations of this would be for supporting a publicly accessible server (such as web) on a local internet connection. The server sits in the DMZ and can be accessed from the Internet, but it cannot access the trusted network. OpenWRT probably needs no introduction, the brilliant open source and community driven Linux based embedded router stack. I run it on my Netgear WNDR3800. I have an ODRIOD-U3 (little ARM box) running Fedora, which runs a web server. This is what I want to make publicly available in my DMZ. 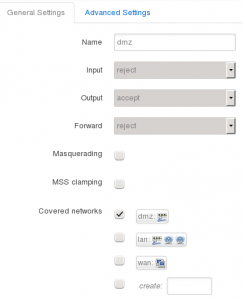 So, how to create a DMZ in OpenWRT? Some commercial routers have a single button “make a DMZ” and everything is handled behind the scenes for you. Not so with OpenWRT; it’s powerful, transparent, and only does what you tell it to, so we have to create it manually. The eth1 device maps to the physical WAN port on the back of the router. It’s important to note that the physical interfaces may differ from router to router, depending on the chipsets. The switch (eth0) includes a number of ports, including the four physical ones on the back of the router, a fifth one that’s not used, as well as one that connects to the CPU. 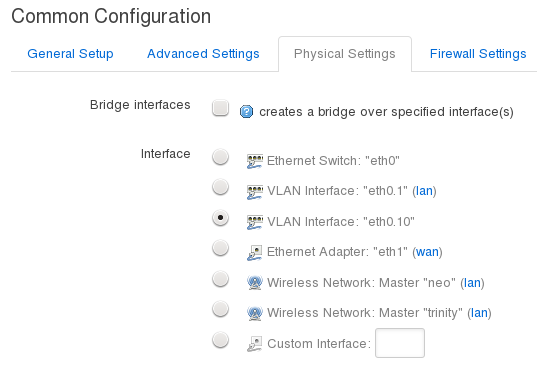 The switch supports VLANs (virtual LANs), and by default OpenWRT puts all of those ports into VLAN 1. This means that physical connections in those four ports at the back are on the same virtual switch and are able to communicate with each other. You can imagine that if I changed the VLAN of one of those ports to VLAN 10, that the device plugged into that port would no-longer be able to communicate with other devices on the switch. This is the basis for our DMZ. 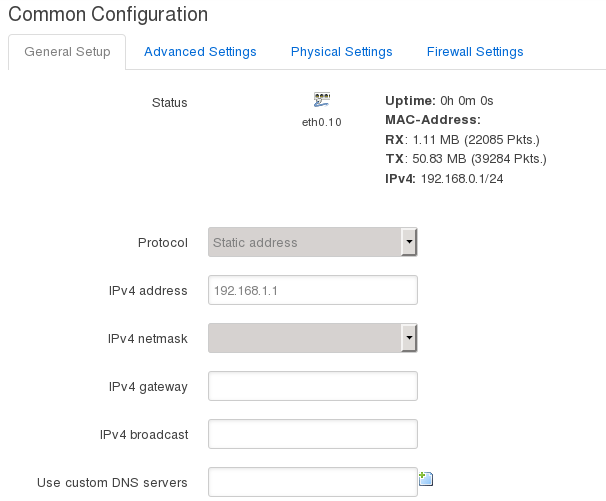 The configuration of the switch (including the mapping of ports to VLANs) is available under the switch menu, Network -> Switch. 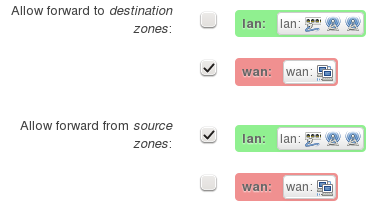 Note: The port numbers on the switch in OpenWRT do not necessarily map in the right direction to the back of the router. In my case, port 0 on the switch is port 4 on the back of the router. 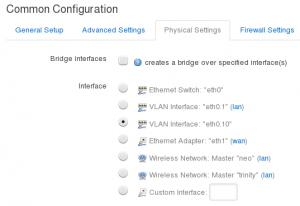 The first thing we want to do is create VLAN 10 and then assign one of the ports to that VLAN, removing it from VLAN 1. 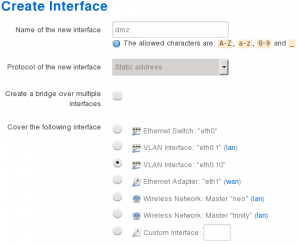 Setting VLAN to untagged tells the switch to add the appropriate VLAN tag to each ethernet frame as the traffic exits that port. The setting tagged means that the switch should expect that traffic leaving the port has already been tagged, perhaps by the operating system running on the device which is attached to the port. Port 0 (port 4 on the back of the router) is now in VLAN 10, while the remaining three ports are in VLAN 1 and so it is now isolated from the others. The CPU is also in VLAN 10, else we would not be able to pass any traffic to port 0. 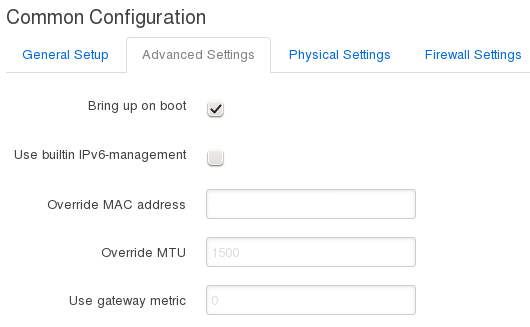 In OpenWRT you create virtual network interfaces which map to physical devices on the router. These are available under the Network -> Interfaces menu. Once we have created our new VLAN, we want to create a new a interface for the DMZ. In the same way that the VLAN 1 device, eth0.1, is attached to the LAN interface, we will attach VLAN 10 device, eth0.10, to our new DMZ interface. You should be presented with a new configuration screen for this interface. 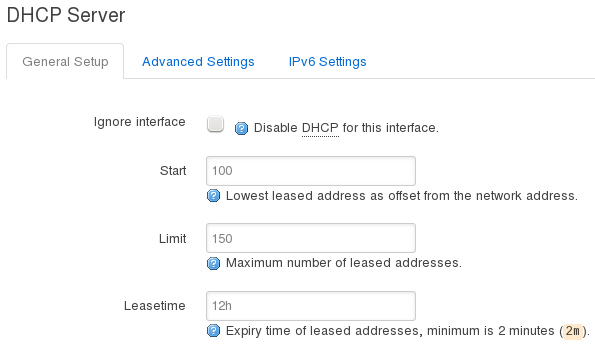 We now have a new interface or zone called for the DMZ that’s set to use out DMZ VLAN. It has a new firewall policy assigned to it, dmz, which we now need to configure. Let’s do zone settings first. Now let’s do port forwards. Finally, let’s finish with traffic rules. 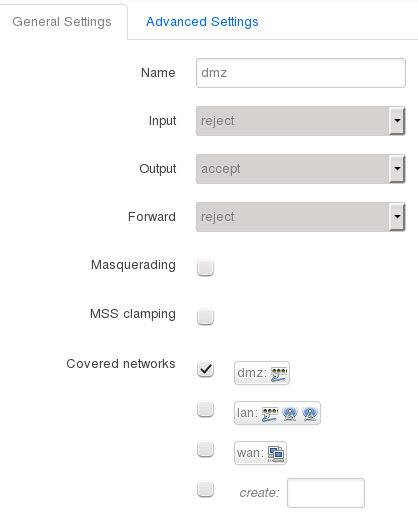 If you want to be able to ping the router from the DMZ clients, do this. Remember we told the router to log the DMZ? Well now we can monitor the firewall rules by browsing to Status -> Kernel Log. Here you should be able to see any rejects that are happening, which is useful to work out why something isn’t happening as you expect on the DMZ. For example, disable the dmz-ping rule and then try to ping the router from your DMZ server. Refresh the Kernel Log and you should see entries appear. Plug in a device, see if it gets an IP address. Try to ping 8.8.8.8 (Google DNS server), then try to ping google.com. Set up a web server on your DMZ box, or use netcat to listen on port 80. Get your external IP address from the router, or Google “my ip”. Now get a friend to browse to your IP and see if you see your web server. Thanks Christopher. Was looking for this kind of tutorial, simple and yet detailed and complete. Thanks for this! Good stuff!! Very nice writeup. Stuff like this has tremendous value. I tried what you did but now my ps4 which was the dmz ip address wont get internet connection. while it did before i tried this. could you know where my mistake could be? I would suggest plugging a computer into the port and see what it looks like. Does it get an IP address set? 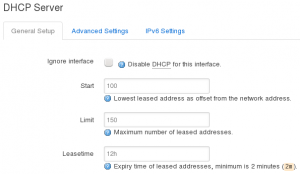 If not it could be dhcp problem so you need to check the firewall section about allowing DHCP. Does it have a default route? If not, you can’t look up anything. Does it have DNS set and does DNS work? If not, you might need to check the firewall section about allowing DNS. Excellent tutorial. Thanks for sharing. Good tutorial, but if the DMZ netmask was empty, all traffic has been blocked. After I set it (255.255.255.0) all gone fine! 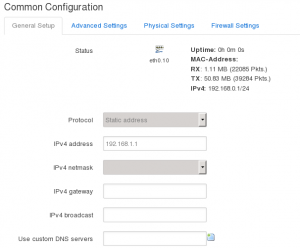 Does DMZ VLAN make the other LAN ports can’t access the internet? I would like to have 2 separate networks on one router, one with access to internet and the other is for local intranet only ( no internet access). No, those other ports should still work. I’ve followed your tutorial and everything works except my DMZ server timeouts when I run wget or apt-get update. Ping for both 8.8.8.8 and google.com issued on a server works so dns config is fine but it seems that firewall is somehow blocking other traffic :(. WAN -> DMZ and LAN -> DMZ connections are also fine. Hmm.. maybe check your openwrt logs to see if there are packets being dropped? I assume you’re allowing all traffic between DMZ and WAN and not blocking anything external? If you can, maybe to a tcpdump on the router and see what’s happening with your packets. Maybe they are going out bt not getting NAT’d and so there’s no return traffic, or something.